South African museums tell the tragic and ultimately uplifting story of apartheid history in South Africa. Before Nelson Mandela became President of South Africa, he served 27 years in prison. The apartheid government of South Africa imprisoned political leaders who opposed segregating races. 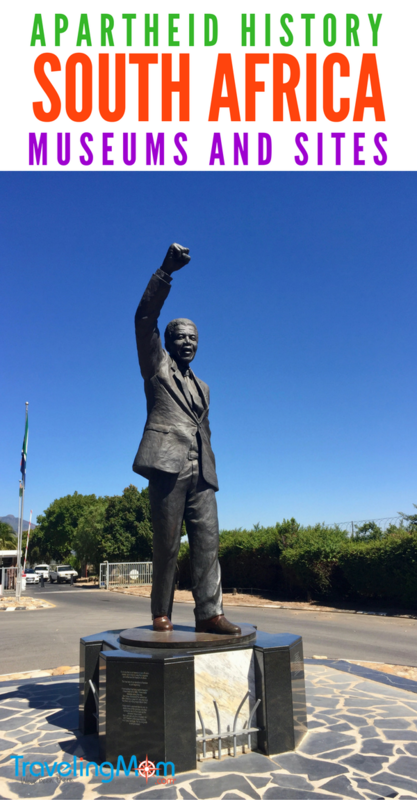 In South Africa, World TravelingMom learned the fascinating story of how South Africans overturned the apartheid government and elected Mandela President, from several excellent history museums. 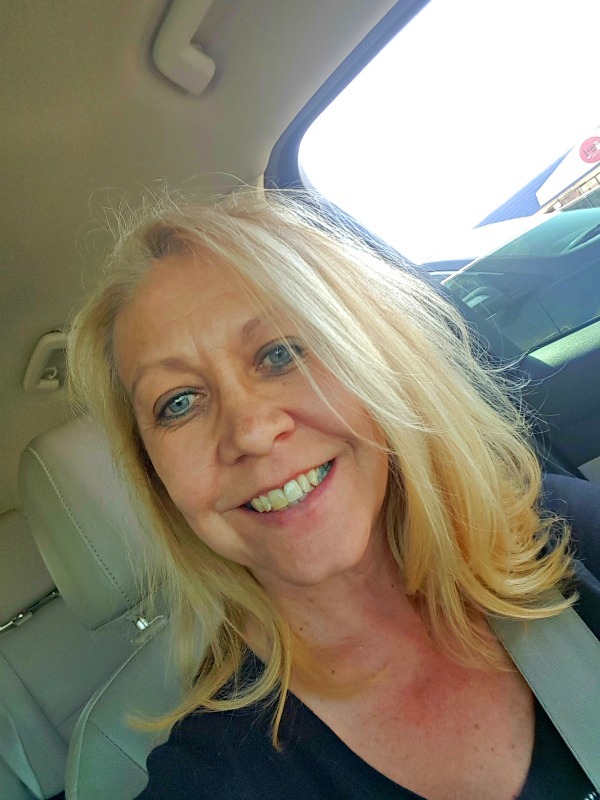 My husband and I visited South Africa for its stunning natural beauty and to see elephants, giraffes, and lions on safari. But we also visited South Africa to learn its tragic yet inspiring history. Each museum and site tells part of the story of how South Africa ended apartheid. The apartheid government of South Africa imprisoned Nelson Mandela for 27 years. Mandela’s crime was opposing racial segregation, known as apartheid. And for 18 years, Mandela was imprisoned on a rocky island off the coast of Cape Town. 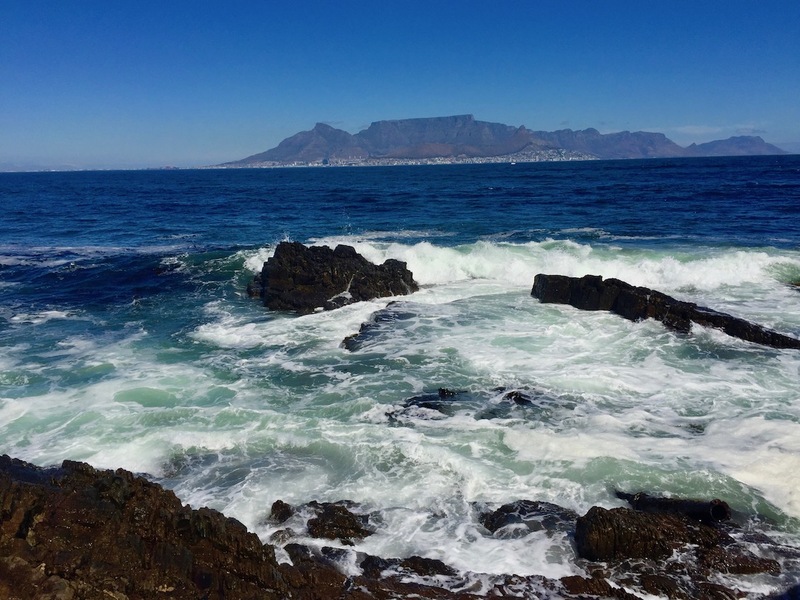 We took a boat to the island to visit Mandela’s tiny cell on Robben Island. And my husband and I were shocked that Mandela had a bucket but no toilet. Also, we saw the limestone quarry where Mandela was forced to work with blinding white rock in the bright sun, damaging his eyes. Importantly, our guide was himself a former political prisoner. Like most guides at Robben Island, he had served part of his sentence in the prison cells he showed us. 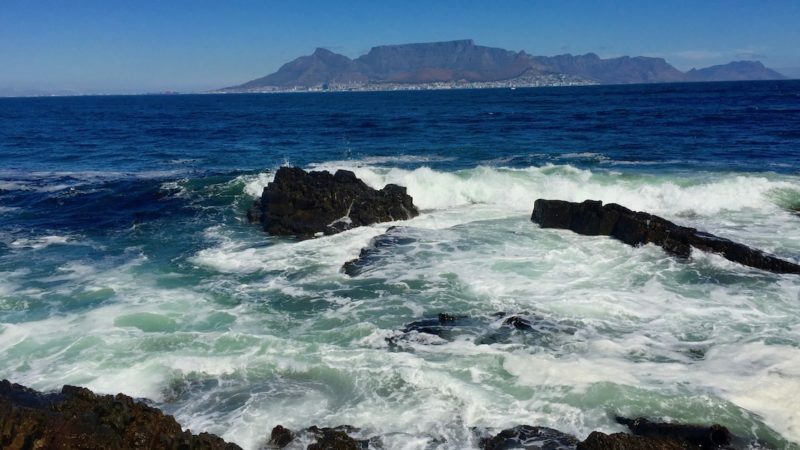 TravelingMom tip: We traveled to South Africa with a tour company, Gate 1 Tours. And they bought our tickets to visit Robben Island a month in advance. Space is limited. And tickets are timed, so don’t miss the boat! The Apartheid Museum is brilliant. 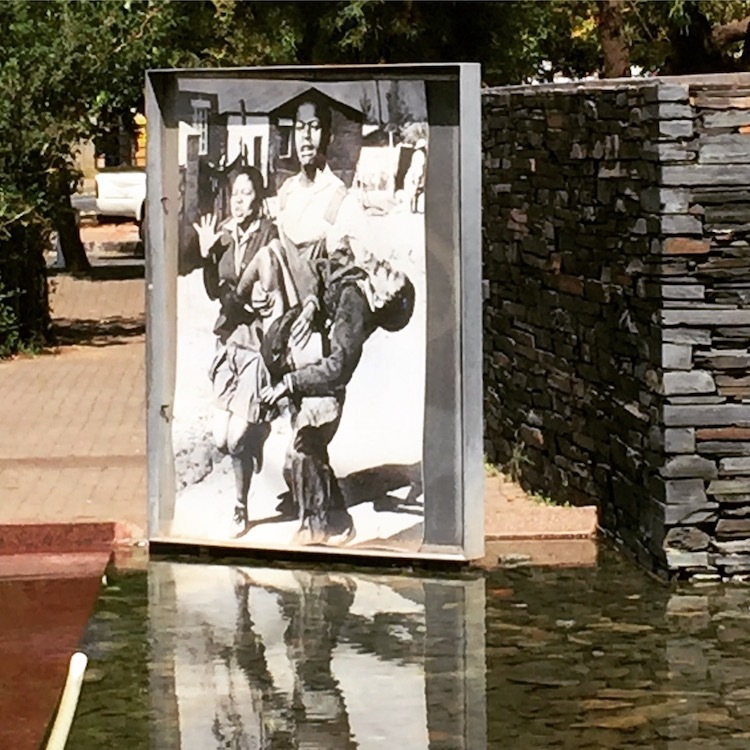 The Museum tells South Africa’s brutal history of apartheid. That’s the system of laws and customs that, until 1994, kept the white minority population in control. And separate from the black majority. The Apartheid Museum starts apartheid history in South Africa with Dutch and English colonization. It tells the story of vastly different daily lives under apartheid for white, “coloured,” and black South Africans. Most importantly, the Museum uses video, photographs, creative exhibits, and interviews. And that helped me see apartheid from the perspectives of different people. Also, the museum explains the successful struggle against apartheid in South Africa. For me, it was especially powerful to see clips from propaganda films and video of apartheid leaders justifying segregation. And video interviews with activists, in their own words. Also, a gigantic tank that the apartheid government used to patrol the black shantytowns shocked me. That’s because the anti-apartheid activists in the townships often were teenagers. And their “weapons” often were rocks, not guns. Many blacks in South Africa worked in conditions similar to slavery. And apartheid history in South Africa meant the government violently enforced its rules, using secret police, kidnapping, mental and physical torture, and murder. The Apartheid Museum does not shrink from explaining ugly sides of the struggle against apartheid. For example, the Museum explains that some anti-apartheid activists burned alive accused police informants by lighting gasoline-filled tires around their necks, called “necklaces.” We saw moving video testimony before the Truth and Reconciliation Commission. Archbishop Desmond Tutu chaired the Commission. Commissioners, survivors of torture, and families of activists murdered by the apartheid government each directly questioned the torturers. The emotional power of the Apartheid Museum reminded me of Yad Vashem, the brilliant Holocaust museum in Israel. But the Apartheid Museum may too emotionally difficult for kids under 12. Also, be sure to block out the time you’ll want. We spent 4 intense hours at the Apartheid Museum. And we needed a break midway at the museum café. This Museum in Cape Town honors a vanished neighborhood. 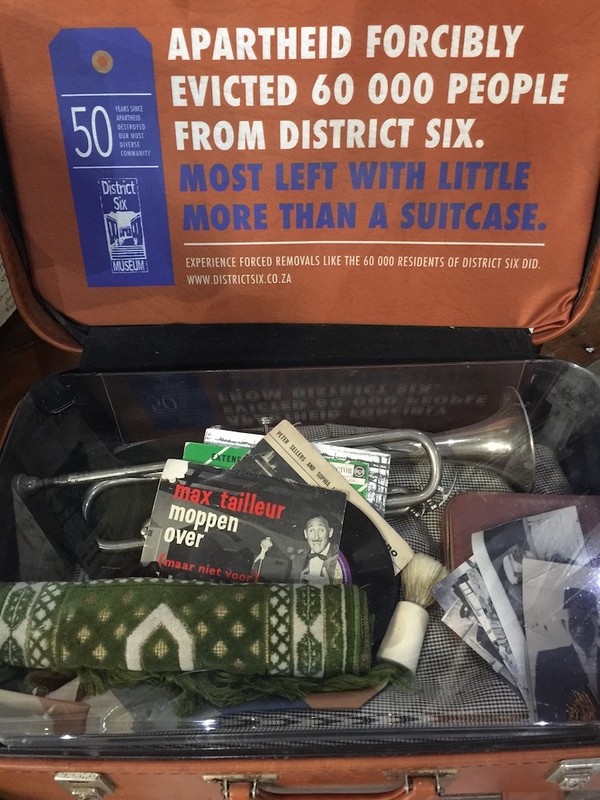 Specifically, the District Six Museum honors the “Coloured” population that was forced to leave when the apartheid government bulldozed their neighborhood. My husband and I learned that in 1966, the apartheid government declared this vibrant Cape Town neighborhood a “whites only” area. But 60,000 “coloured” people lived there. So the apartheid government kicked out all people descended from Indians, Indonesians, or mixed race. Then, it razed their houses, schools, and businesses. 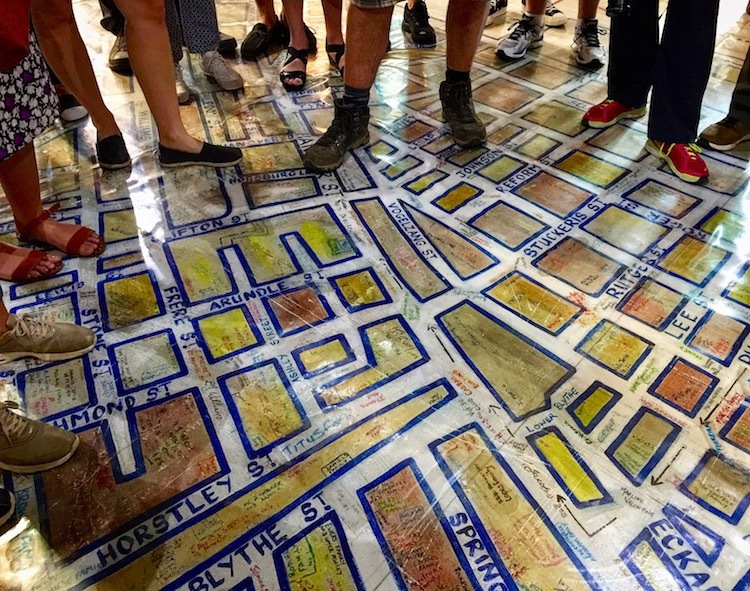 The District Six Museum tells stories of the individuals and community forced to move to make way for “whites only.” This floor map shows the neighborhood that used to be. South Africa built its Constitutional Court on the Johannesburg site of a former political prison. Both Mahatma Gandhi and Nelson Mandela were prisoners here at different times. The Court honors the site’s history by retaining parts of the destroyed prison. For more on the fascinating tour of the Constitutional Court and the site’s prison history, click here. A different way to experience the legacy of apartheid history in South Africa is to visit a township. A guide is necessary. In the black township of Soweto in Johannesburg, Gate 1 Tours arranged a guided bus tour. Our excellent local guide, a Soweto resident, pointed out the houses of both Archbishop Desmond Tutu and Nelson Mandela. Remarkably, both Nobel Peace Prize winners lived on the same street. We briefly visited the small museum at Mandela’s former house. Similarly, on our first visit to South Africa in 2016, the travel company Tribal Meetings arranged for visits to a township in Cape Town. 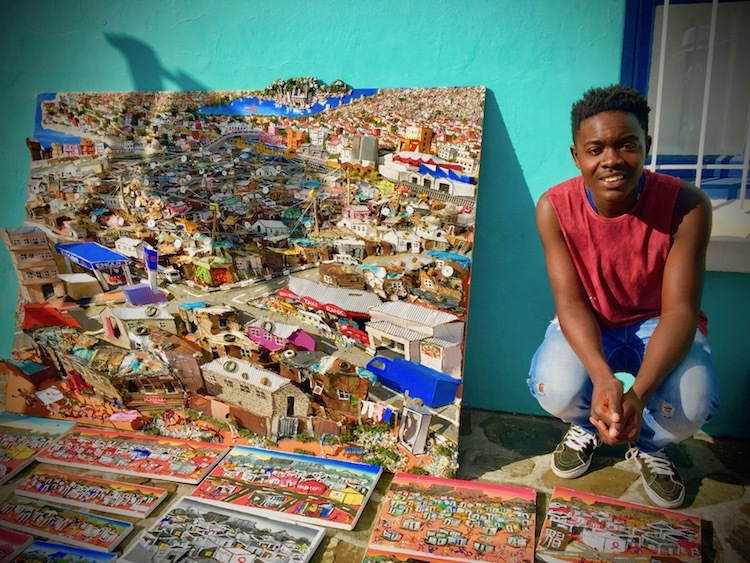 First, in Langa Township, a township resident walked us through his neighborhood. Our guide introduced us to residents and to children playing. And even took us into his own house. Best of all, Tribal Meetings arranged a banquet at Lelana Restaurant in Langa Township. We heard local musicians and ate ostrich and antelope. Most importantly, we heard a moving talk by the owner, Sheila. Sheila cleaned houses for years. One day while cleaning, she found a receipt. And she realized her employers paid her for a month what they’d paid for 2 cheeses and a glass of wine. Shortly after, Sheila started her restaurant in one room of her 2-room house. The restaurant, since expanded, only opens for big groups. To learn apartheid history in South Africa before our first visit, we watched movies based on real events. For example, Mandela: Long Walk to Freedom (2013), starring Idris Elba, is based on the autobiography of Nelson Mandela. And a different view is Invictus (2009), starring Morgan Freeman, about how the new President Mandela tried to unify the country after apartheid by using sports, the national rugby team. Also, several books helped me prepare. For example, Kaffir Boy (1986) is a memoir of growing up very poor in Soweto by Mark Mathabane. By contrast, Long Walk to Freedom: The Autobiography of Nelson Mandela (short version is 150 pages) is about leading the political movement. And for fiction, Cry, the Beloved Country (1948) is the classic novel by Alan Paton set in the 1940’s, before apartheid existed officially. But the story shows the starkly different conditions for blacks and whites in South Africa. Do you hope to visit South Africa one day, or to return to visit it again? Tell us about it in the comments. An important conversation and a big part of South Africa (and the world’s) history. 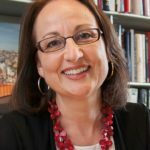 Insightful article. Stirring reporting. Thank you. Every time I think I know a little history, I realize so much more depth is necessary to understand. I appreciate your travels. Quite a parallel the teens you write about in South Africa, and America’s teens struggling with gun violence. Also, you found museum docents who were also prisoners and I just did too in the Jackson MS new Civil Rights Museum.